#4 - Participants in a futures market: Who trades futures? A futures contract is something that you might have heard of, either in the media or read about on a website or in the newspaper. Unlike stocks for example which represents equity in a company and can be held for long periods of time or can change hands numerous times, a futures contract has different characteristics, making it unique from other financial instruments. A futures contract is a legal agreement where the buyer of the contract agrees to pay a predetermined price for delivery of the underlying commodity or asset at a predetermined date. Think of futures contract as paying for something that will be delivered to you a month or a few months later. A futures contract trades on a futures exchange, where the contracts can vary from assets such as a barrel of Crude oil to a bushel of grain to a pound of coffee, or any commodity or asset that has value. The best way to illustrate a futures contract is by using this example. Let's say you run a café, and a little birdie told you about a new legislation doing rounds, which if passed could see new taxes imposed on coffee that could see prices rise by at least 5%. To hedge yourself against this potential price increase, you can buy a futures contract for coffee at a price that is closer to the current price. So you enter an agreement with a seller who promises you to deliver 37,500 pounds of coffee, 90 days later for the current price. Unless you liquidate your futures contract, at the end of the term, the coffee is delivered to you, regardless of what the current price of coffee is. If the rumors you heard were true and indeed the new taxes were imposed, then congratulations! You managed to hedge the risk of price increase by purchasing coffee via the futures contract. This transaction is nothing but a futures contract at work at the most basic level. Other examples of a futures contract can be a mortgage with a fixed interest rate for a fixed period of time. Whether interest rates go up or down, you pay the same fixed interest rate for the tenure of your mortgage. It is essentially a form of a futures contract. By now it should be clear what a futures contract is, and it should give the reader a fair idea of things work in the futures markets. But a bit of history on the futures markets to gain a better understanding. The futures markets started off as sellers and buyers of a commodity began to commit to future exchanges of the asset. 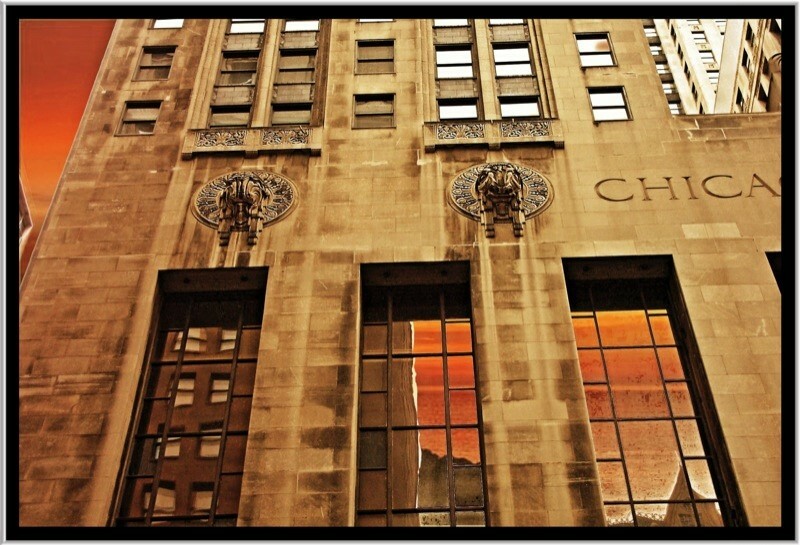 The Chicago Board of Trade (CBOT) was established 1848 and is known to be one of the oldest futures exchange in the United States. The futures contracts were initially traded at the exchange in a pit. 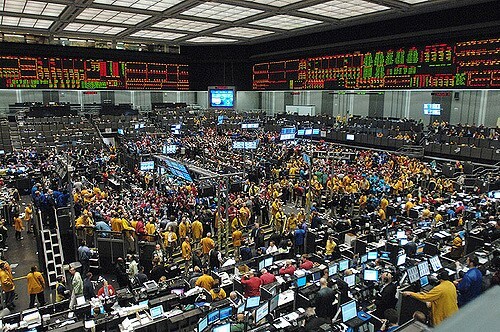 A pit or a trading floor was a designated area for each of the commodities available to trade at the futures trading exchange. Traders engage in trading by means of Open Outcry, shouting out their bids and offers. In more recent times, technology and computers have replaced most of the pits, with trades being now conducted electronically. Futures contracts prices are settled daily, unlike a stock where the net gain or loss is realized only after the investor sells their shares. Although a futures contract implies delivery of the underlying asset, the buyer and the seller can liquidate their contract at any point without actual delivery and can act independently of each other. It is often said that anything of value can be found being traded in the futures markets. However, there are some standard conditions that must be met for a commodity or an asset to be able to trade as futures contracts. Currencies: US Dollar Index, British Pound, Euro FX, etc. Energies: Crude Oil, Gasoline RBOB, Natural Gas, Brent Oil, etc. 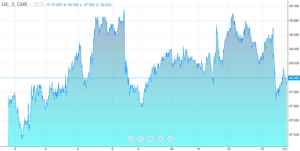 Financials: T-Bond, 10-Year T-Note, Eurodollar, 30-day Fed funds, etc. Grains: Wheat, Corn, Oats, Soybeans, etc. Indices: S&P500 E-Mini, Nasdaq 100 E-Mini, Dow Industrials E-Mini, etc. Meats: Live Cattle, Feeder Cattle, Lean Hogs, etc. Softs: Cotton, Coffee, Cocoa, Sugar, etc. 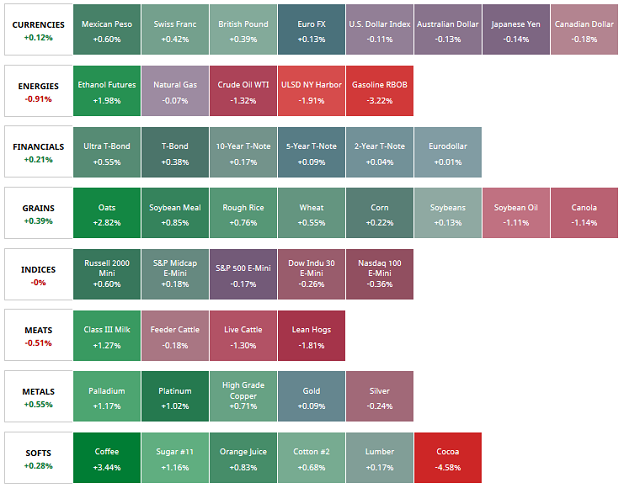 The picture below shows a snapshot of the major commodities in the futures market. The table below gives a list of symbols for each of the major commodities. Note that the symbols (and price) may change depending on the exchange where they are traded. For example NYMEX Crude Oil (WTI) has the symbol CL, whereas ICE Futures Crude Oil has the symbol WI. Therefore in most cases, when a futures commodity contract is referenced, the exchange name is also mentioned, such as NYMEX Crude Oil, or COMEX Gold. Every futures contract has a physical delivery or an expiry month, also known as a contract month. This is the month where the seller must deliver the commodity if the buyer still holds the contract. The expiry month or delivery month is the final mark-to-market or fair value accounting. This is where the asset or commodity value is determined according to the market price and arrives at a profit or loss for the two parties involved in the futures transaction. The exact date for the delivery can vary from one exchange to another as well as the contract and the commodity itself. Based on the commodity that you are trading, you can find out about the First Trade and Last Trade date. Depending on the commodity or asset, the expiry month can vary. For example, Crude oil futures contracts expire monthly, whereas Financials futures contracts expire quarterly. No matter when the contracts expire, every month is denoted by a letter as shown in the table below. A futures contract follows a distinctive terminology, unlike a stock which has the same ticker symbol. Every futures contract has its own pricing structure, meaning that buying one contract of crude oil is not the same as buying one contract of wheat futures. The margin requirements also vary depending on the contract that you are trading. Hedgers: The hedgers use futures contracts for protection against adverse price movements in the underlying commodity. Hedgers are made up of businesses or individuals who deal with the underlying commodity at some point. This could be a flour manufacturing business that deals in sourcing wheat as the raw material, or it could be a wheat farmer. Speculators: The speculators are the second major group and are comprised of traders and investors. Speculators do not have any actual involvement in the underlying commodity and are there simply to take advantage of the price discrepancy. The futures markets, as we have learned above offers some distinctive characteristics that are usually not found in other markets. Prices are driven by supply and demand and a futures trader needs to always remain in the know about potential developments. To successfully trade futures, you need to have a good understanding of the commodity that you are trading. The futures markets offer the advantage of both leverage and lower margin requirements, making it affordable for most traders.